Free Ribbon and Elastic with all Russian Pointe purchases! 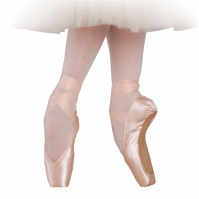 To view our video on choosing the perfect Russian Pointe model and fit visit our video page. 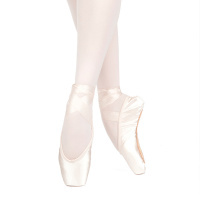 Russian Pointe - Discontinued Soft and Medium Shank Pointe Shoes$75.00Clearance Price! 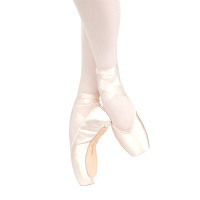 Russian Pointe Entrada Pointe Shoes$39.99Clearance Price! Founded by Aleksandra Efimova to provide pointe shoes in the traditional Moscow style, Russian Pointe shoes are trusted by dancers all over the world. 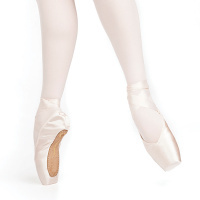 DanceSupplies.com has a large selection of the most popular Russian Pointe styles, including Rubin, Almaz, Entrada Pro, Brava, Sapfir, and more. 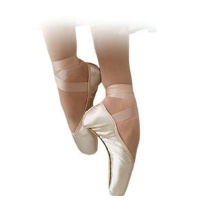 We carry two different collections of Russian Pointe shoes. The Spotlight Collection features traditional pleating and a higher crown - designed for dancers with moderately shallow or fuller feet. The Jewels Collection is designed with a pleatless box and a lower crown, better suited for dancers with shallow feet. Need help choosing the right size for you? Consult our Russian Pointe Sizing Chart, designed to help you find the perfect fit!